SOLARCHOICE is Austin Utilities’ (AU) community solar program. 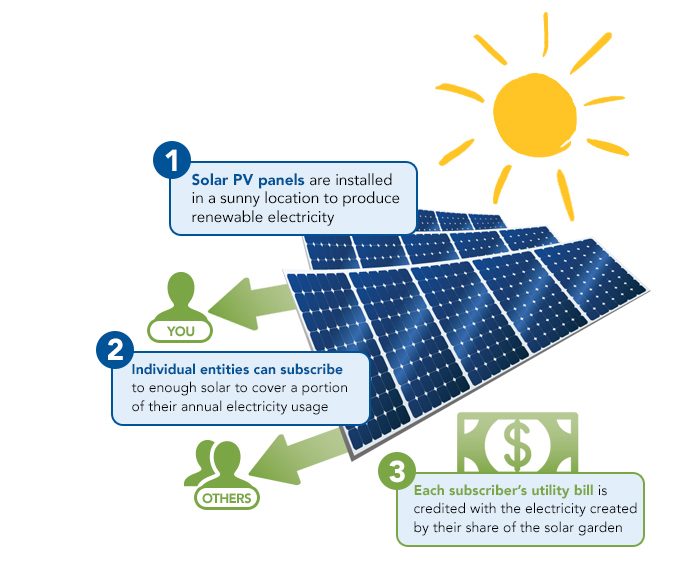 Community Solar is a way to purchase solar without installing it on your rooftop or property. It’s an easy way to join the solar movement at a level that is affordable to you. It also allows customers an opportunity to gain a level of price certainty by locking in the cost of a portion of their future energy usage. While only 25% of rooftops are suitable for solar installations, community solar provides an equitable way to allow those who want more solar to get it without impacting those who do not. Pricing is set on a per panel basis. Each customer may purchase the output from enough panels to cover up to 75% of their average monthly usage over the most recent 12 month period. * One 335 watt panel is expected to produce 515 kWh in year 1 and average 501 kWh per year for the first 12 year. ** To participate in the SOLARCHOICE Program customer must be current with payments. *** To participate in the SOLARCHOICE payment plan customer must pay a $25 processing fee, and have good credit standing with the utility. Payment will be applied to the monthly utility bill. If you move to another address in town your SOLARCHOICE subscription moves with you. If you move outside Austin Utilities' service territory, you may transfer your subscription to another Austin Utilities customer or sell it to an interested party on the Austin Utilities system. Before you start the SOLARCHOICE application you will need to know your account number which can be found on your monthly billing statement, and your average monthly usage. If you need help call our office at 507-433-8886. After your Application is approved you will receive a Subscription Agreement. You will need to sign and return the Subscription Agreement along with your payment to become a program subscriber.